Romotech from Papendrecht (the Netherlands) is an importer of Kohler & Lombardini combustion engines and parts, and a producer of compact generators and water pumps and hybrid energy systems, including the Rohyb hybrid genset. 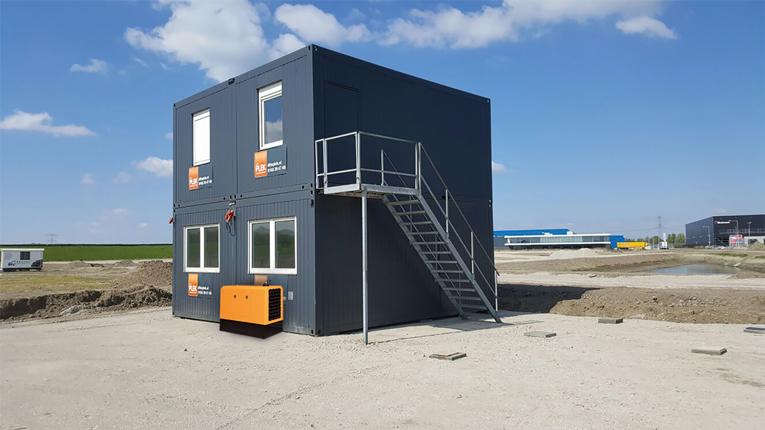 The Rohyb system is mainly intended for remote locations and conditions in which power is – temporarily or permanently – unavailable yet required, and a constantly running conventional generator is undesirable. In these cases, the Rohyb hybrid generator supplies silent green power that consumes over 50 % less fuel, makes up to 50 % less noise and produces up to 50 % fewer emissions. In consultation with Mastervolt, Romotech decided to equip this hybrid generator with optional solar panels with an MLI Ultra 24/5000 Lithium Ion battery for power storage, combined with Mastervolt’s renowned battery charger/inverter, the Mass Combi Ultra 24/3500, and the Solar ChargeMaster SCM60 charge regulator. An important principle was that the set had to be suitable for the type of peak loads associated with the energy supply of construction trailers/mobile office units and power plants. In these conditions, lots of energy is needed when employees start their working day and switch on lighting, heating, computers, coffee makers and other equipment. Most consumers are switched off when the morning comes to an end, resulting in a considerably lower energy demand. 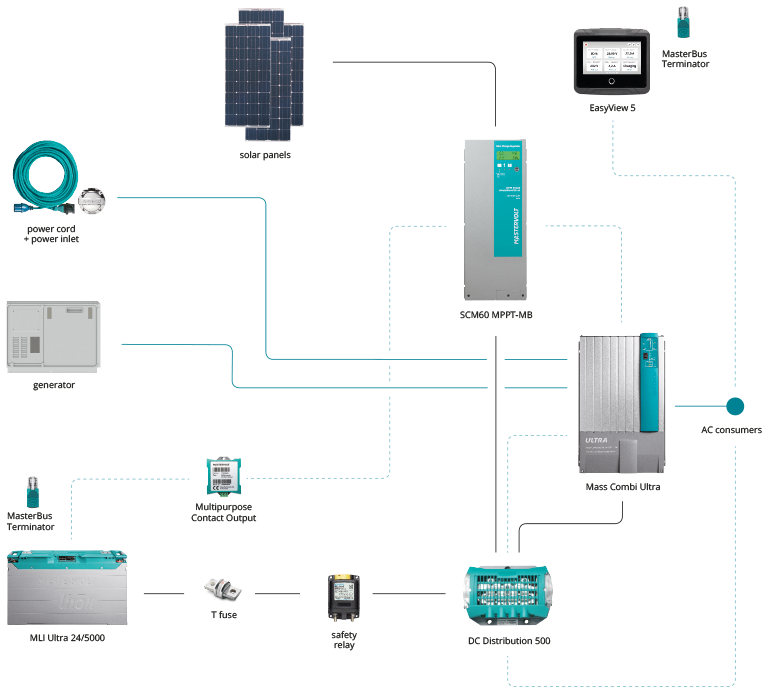 The application of a hybrid system is very suitable for this strongly varying energy demand as the generator automatically switches off when demand falls and the energy supply is realised via the inverter component of the Mass Combi. This results in less running time and wear, lower fuel consumption and reduced pollution. The Rohyb system is also suitable for mobile applications and can even be built-in ‘underfloor’ (for example in a truck) thanks to its limited height of just 65 cm. Reliable storage via an MLI Ultra 24/5000 Lithium Ion battery. Quick charging time required: fully charged in under an hour. 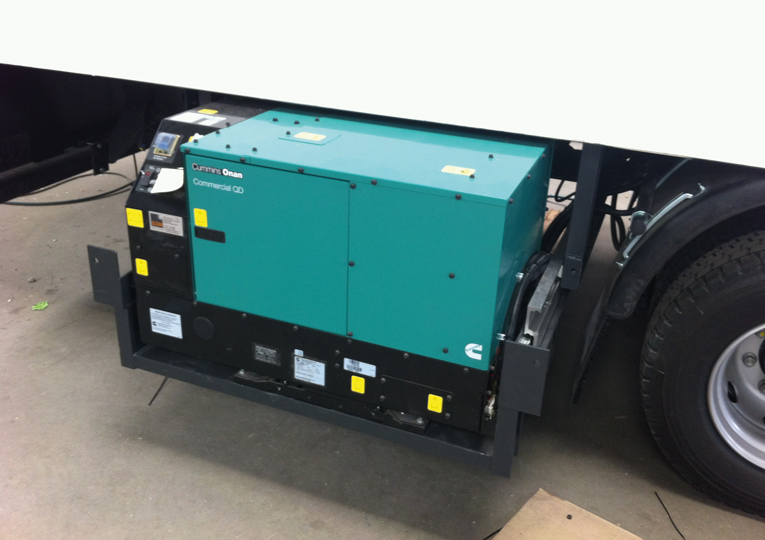 Less running time for the generator resulting in reduced fuel consumption, low noise and less maintenance. Smart and transition-free switching between grid connection, generator and inverter. The batteries can as an option also be charged via the solar panels. The load jumps to a capacity that is larger than the inverter can supply. The generator starts automatically to supply the extra 4.5 kW capacity – the power boost function of the Mass Combi Ultra. The Rohyb can now supply a total capacity of 11.5 kW. When the load is reduced, the generator can charge the battery bank parallel to feeding the load. The battery reaches a low status of 20 %. The generator starts automatically to charge the battery. The very best Lithium Ion technology for extreme conditions (high charge/discharge current, humidity, mechanical shocks or vibrations). Includes an alert Battery Management System which ensures an optimal use of each individual cell, even when charging and discharging quickly, and integrated battery monitoring for constant insight into the current battery status. The Mass Combi Ultra is available in 12, 24 and 48 V models with associated charging and inverter capacities. For higher capacities up to 35 kW the Combi Ultra can be used in a parallel or 3-phase configuration. The SCM60 MPPT-MB is the largest MPPT solar charge regulator by Mastervolt. With a connection capacity of 600 to 3600 Wp in solar panels, a connection for 12, 24 and 48 Volt battery banks, and an integrated MasterBus connection, this charge regulator is ideal for medium and large systems such as Romotech’s hybrid generator set. The innovative technology in the Mastervolt MPPT charge regulators also increases the yield of the solar panels. Compared to PWM regulators, the SCM60 MPPT-MB charges your batteries up to 30 % faster with the same number of panels.